It is nice to see monotone done with a color other than black. Comments on "On The Street.......Sixth Ave"
This guy is so chic! I see him around town alot- do you know who he is? It is always great to see someone chic wearing something other than the tried and true all black look. yum. now this tastes good. Great glasses frames for his face, too. Even carries a chain wallet....nice rocknroll/streetwear touch to his tailored ensemble. Great look, he seems cool to hang out with. he is just so beautiful. and so stylish. 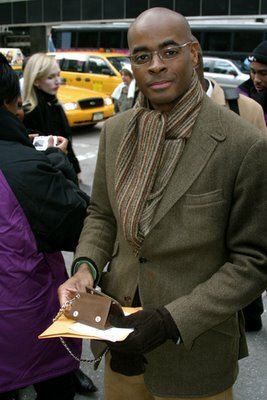 He is Kevin Stewart, Style Director of Essence. Kevin Stewart alway the gentleman in person and dress. This is all to the good. I could look at him all day. the blonde in the background of the photo is an editor for Vogue. i don't remember her name but i remember that facial expression! she was on a few episodes of the hills season 1 i think it was.